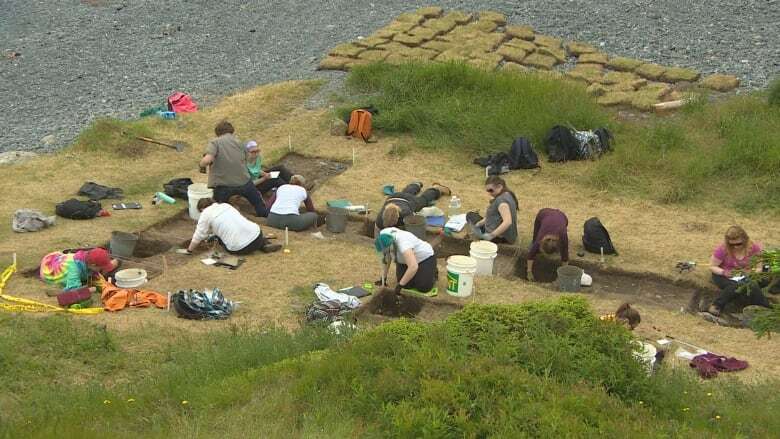 A group of archeology students is spending part of the summer digging up some of the province's long-buried history, in Tors Cove. 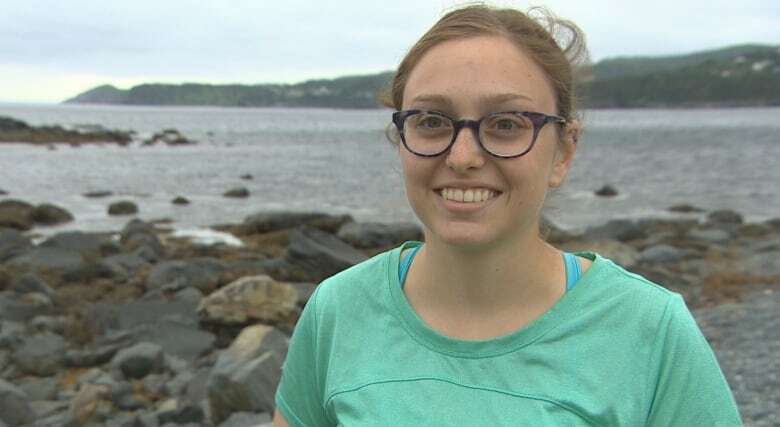 A group of Memorial University archeology students has stepped outside the classroom for the summer, to dig up part of the province's history in Tors Cove, on the southern shore of the Avalon Peninsula. "I love it, it's fantastic. I've learned a lot just in the last few weeks that we've been out here," said first-year student Hailey Schmitke, taking a break from getting her hands dirty in search of centuries-old relics. "It's really something unique to be able to hold an artifact that you know hasn't been seen in hundreds of years, its quite something." The 15 students are working on a site first documented eight or nine years ago, when a local resident alerted the university to some curious objects eroding out of a bank: shards that turned out to be ceramics, clay tobacco pipes and nails, all hints of a possible site for migratory fishermen in the late 17th or early 18th centuries. "It seemed to be fairly intact, so we just left it as it is," said Barry Gaulton, head of the university's archeology department. That all changed this summer. The students, led by archeologist and professor Catherine Losier, have been busy on site for several weeks, dividing the area into one-metre quadrants and scouring each section carefully. "We don't really know what we're going to find, it's the first time we've excavated this site," Losier told CBC News, speaking in French. "At the beginning, it's very intimidating. 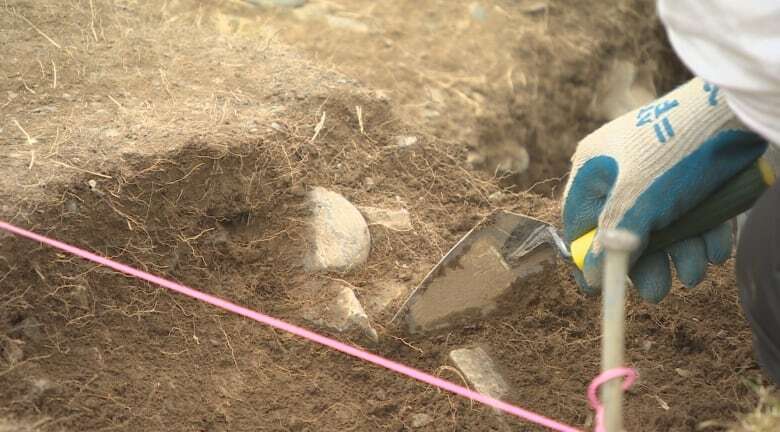 Like we always say in archeology ... when we dig a site like this, we destroy it in the end. We can never dig it again. And the students are very aware of this." While the team has so far not uncovered any structures, they've dug up around 500 objects, ranging from ceramic shards to buttons: the detritus of everyday life that archeologists prize. "Historical documents can give us some details," said Gaulton. "[But] the beauty of archeology is it tells us about the daily life of the fishermen, which is not recorded. What they ate from, the kinds of things they ate, how they went about their daily business." The students are not only shedding light on the province's past, but also illuminating their own classroom studies. "During their degree, they have an enormous amount of theory courses — practical courses too, in the lab — but this is the first real time they're out on the ground," said Losier. "Personally, this is something that I love, teaching these dig schools. It's not the first time that I've done it. It's really something that I quite like, because indeed it's really here that we transmit our passion, the passion of the earth. That's an important part." Losier said after two weeks on site, the students have eased into a routine and are getting more comfortable combing through the dirt, identifying and recording artifacts – the hands-on basics they'll need to pursue a career in the field. Third year student Chanelle Zaphiropoulos agrees, saying the laboratory and field experiences of archeology may be "two sides of the same coin," but being outside this summer has been a special thrill. "Actually being able to do something that since childhood I've thought about is pretty neat, and definitely totally different than when you're in the lab. It's a totally different experience."